The RedeemedReader ladies recall our favorite “love stories” as teens, and rejoice that we grew out of them! But what do we like now? You may have noticed that last Wednesday was Valentine’s Day. Perhaps you celebrated with chocolate and a good book (and we offered you plenty of selections to choose from)! Even if there’s no special person in your life right now, most of those who love a good book also love a good love story. And that started us thinking: what love stories or “romance novels” did we enjoy as teens, and how have our tastes changed? Keep in mind that a love story and a romance novel is not necessarily the same. The former often develops in the context of a larger story or genre, while the latter is all about boy-meets-girl and what happens after that. The early teen years typically see a growing interest in both of these, especially for girls. Janie, Betsy, Megan, Hayley, and Alysha are no exception, though there’s quite a difference in our ages and the genres that were popular during our teen years. Some of us got bit by the “Twilight” phenomenon of the early 2000’s, and some came of age during the Janette Oke era or the age of fantasy. We invite you to listen in on our conversation and see if you can relate. What were the love stories you loved as a teen, and how have your preferences matured? Feel free to let us know in the comments! 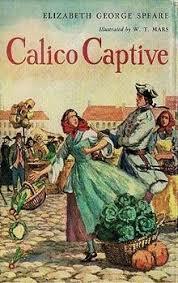 Janie: I was thirteen when I read it, and it was actually more of an adventure tale: Calico Captive by Elizabeth Speare (author of Witch of Blackbird Pond) was based on a true story of the French and Indian War. It begins when Miriam Willard, age 17, is captured by Indians along with her pregnant sister Susanna and Susanna’s little boy. The three are hauled from their home in western Massachusetts up to Montreal to be sold as slaves, with many hardships along the way. But in Montreal the sisters are lucky enough to be indentured to a wealthy French Catholic family who treat them more as guests than slaves. And then Miriam meets lively, handsome Pierre, who shows a flattering interest in her. Susanna is a voice of reason throughout, and even though my heart was for Pierre, my head agreed it was best for the sisters to return to Massachusetts when their ransom was arranged. And where Miriam had a nice Puritan boy waiting for her! That’s the love story I remember loving the best, and I could have done worse. It introduced me to the idea that romantic attraction isn’t enough; a suitable match also includes shared values and culture. Best of all, it’s still in print! Hayley: Janie, that was one of my favorites, too! And even though I loved Pierre, each time I had to admit that she was making the right decision going back to Massachusetts. Aside from Jane Austen, who I discovered at 12, my favorite books with romance were historical. On the fiction side, first there were Ellis Peters’ Brother Cadfael series, always featuring a romantic subplot. Then there were standalone books like Calico Captive and Mara, Daughter of the Nile. 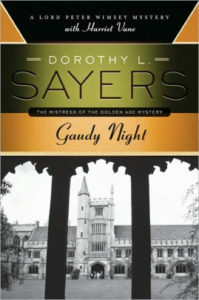 I avoided the vampire craze, but around 17, I stumbled onto Dorothy Sayers and promptly fell in love with Lord Peter Wimsey. So, historical fiction (including Gene Stratton Porter) and mysteries or biography/memoirs with some romance, and a lot of Jane Austen were my romantic reads as a teen. Betsy: If heart-related emojis had been around when I was a teen, I would have been an over-user! The first books I remember really loving—and for their romance elements as much as the rest of the story—were Little Women and Anne of Green Gables. (Oh, Gilbert! Be still my beating heart!) I read both multiple times in late middle school and thoroughly enjoyed every part of the stories, all of the characters, the many ways relationships in general matured and progressed through the narratives. I never get tired of either of them. When I got a little older, I fell hard for the rather saccharine Christian fiction romances that were popular: Grace Livingston Hill (an author I read alongside with my grandmother), Janette Oke, Brock and Bodie Thoene, Michael Phillips and Judith Pella. While I loved the history presented in some of those series, it was an unhealthy, lopsided reading diet at best. Reading the same books as my grandmother really enriched our own relationship, but I would have benefited from some more nuanced relationship portrayals as well. Ironically, perhaps, the only other “romance” I remember reading and enjoying in high school was Wuthering Heights. Its gothic style no doubt resonated with my over dramatic teenage heart. Janie: Ah yes . . . Wuthering Heights. Healthcliffe as the epitome of the “tortured hero” type that only true love can heal—if true love doesn’t die first, like poor Cathy. I think girls are still vulnerable to that stereotype, even though they’re supposed to be tougher now. 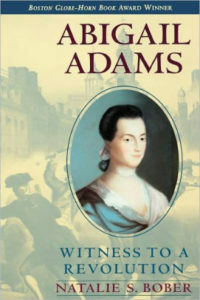 Betsy: I wish I’d had something like the biography of Abigail Adams I mention later—or the Queen’s Thief books. Something that portrayed love, courtship, and all its excitement along with the maturing of love in a married relationship with all its struggles and benefits. True love in a marriage is so much richer than its flashy, youthful counterpart. It’s worth knowing what the reward can look like for those who continue to mature and practice self control! Alysha: I too, would have been an abuser of heart shaped emojis, and I will admit, I was all over the sparkly heart stickers and dreams of romance as I saw portrayed in the media. My mom is a huge musical enthusiast, and I was brought up on a steady diet of Golden Age Hollywood romance. I had an idealized view of romance from the television I watched, and the books I read were no better. I grew up loving fairy tales and the idea of a handsome prince who would come take me away and love me forever entranced my mind. I gorged myself on romance in most of my media consumption. It was not a healthy balance of genres. I too fell for the overly pleasant Christian romances, and I filled my teenage years with the works of Robin Jones Gunn and Lori Wick among others. Once I was a senior in high school, I became “vampire bit” as Janie said earlier. I hate to admit this now, but I was all about the Twilight books, and other similar fantasy stories. It was actually a conversation with a male friend of mine (who is now my husband), that started me thinking about the dysfunction in those types of stories. I started to see the huge flaws in storytelling, the emotionally damaging messages being taught, and the obsessive nature of the main characters in those types of stories. I pulled away from romance for a long time, in my reading and writing, but recently, I’ve been drawn to explore those themes again in a healthy manner. Janie: Interesting . . . I think Edward, romantic hero of Twilight, is a variation of the tortured- hero-whom-only-true-love-can-save prototype. I was not averse to it myself: the vampire hero of the old TV soap Dark Shadows was like that too. Isn’t it good we grow up? (or most of us do.) As an adult, the love story that resonates with me most is Anna Karenina. But maybe not for the reasons you’re thinking! The Anna-Vronsky story gets all the big-screen treatment, but there’s another prominent couple whose courtship proceeds, not without fits and starts and quarrels and misunderstandings, to its promised goal of happy matrimony. The Levin-Kitty romance isn’t as dramatic and “shocking” as Anna’s, but I think Tolstoy intended it that way. I read the book in my late twenties, and that was the right time to appreciate the slow, hesitant, sometimes foolish, sometimes heartwarming relationship that grew between Levin and Kitty while Anna and Vronsky were wrecking their lives. Maybe that was Tolstoy’s point, if he had one. But it helped me see that “all for love” is a destructive, deceptive slogan. At least the way it’s usually understood, in tempestuous “forbidden love” and paranormal romance. Megan: Always a hopeless romantic, I started with fairy tales. Beauty and the Beast was a favorite, which led to my deep fondness for Till We Have Faces. I also went through a phase of reading the Oke and Thoene books among others, but none of them have earned a permanent place in my home library. Christian fiction was only slightly more realistic than the fairy tales since there were no traditional folklore motifs, but the literary quality of the fairy tales was certainly richer. Betsy: Thankfully, as I have matured, so have my reading tastes! Like many women, I enjoy Jane Austen romances, but I’ve found myself really drawn to books that portray marriages more than those that portray courtship. No doubt, this is because I am married, now, and there’s a different dynamic to married love than there is to courtship love. I adore the Queen’s Thief books partly because Megan Whalen Turner portrays both sides of marriage: the rocky pursuit before the marriage and the settling in a married couple makes to their new relationship (which still includes that element of pursuit; it’s just tempered by the reality of running a household/kingdom together). My most recent book crush, though, is actually a true love story: Abigail and John Adams. The picture of their love for one another as portrayed in Abigail Adams: Witness to a Revolution is marvelous and made all the better because it is TRUE. There’s an authenticity to it that is often missing in fictional works, and I keep underlining their reflections both on their relationship as well as the roles men and women did/should perform in society and in the family. I’m reading Jane Eyre now for the first time, and am similarly drawn to it—but the true story portrayed by Abigail and John Adams is better! Alysha: Like the rest of you, as I’ve grown, so have my tastes in literature in general, and especially my taste in romantically centered literature. I’ve been drawn to more classic romance stories, such as the one told in Persuasion by Jane Austen. That is actually one of my favorite novels that approaches the courtship side of a relationship. It shows both individuals as flawed people, but highlights the strength of character, intelligence, and compassion in both Wentworth and Anne. I enjoy stories that present obstacles for the couple, but show them both growing and challenging each other. Like you, Betsy, now that I am married, I’m finding that I enjoy stories that show more depth and growth in marriage. In modern YA literature, I actually really enjoyed the story arch of Cinder and Kai that Marissa Meyer presents in her Lunar Chronicles. I love the fact that both characters are drawn to one another, respect each other, and work together to end the oppression of the Lunar people. It’s a YA romance to be sure, and at times succumbs to overly emotional conversations and decisions, but both characters put their own needs aside for a time to focus on the greater picture and that is something I admired in the story. I’m looking forward to reading the Queen’s Thief stories that I’ve been hearing so much about. I long to see romance portrayed in a healthy way in literature. Hayley: Alysha, I enjoyed the romance in Cinder, too! And I can’t wait till you get to read Turner’s Thief series. I think you’ll find a new favorite. It’s hard to add to Betsy’s reasons. Without dwelling deeply, Jane Austen continues to be my romantic favorite. I appreciate her books and observations on human life. I’d also have to add P. G. Wodehouse to my romantic reads, in a comic way. (Technically, I discovered him at 19, so he’s a crossover.) I love the romantic subplots in his books and the way he sees the humor of love. Not that I’d take deep relationship advice from Wodehouse, but like the book of Proverbs, he’s good at pointing out snippets of truth. (Wodehouse is especially good at seeing the silliness of love, and I like the reminder to laugh.) Thanks to Janie’s advice, Perilous Gard has joined my historical romance favorites. I still enjoy reading about real romances from history, but I also continue to enjoy romantic subplots though my genre has moved to fantasy and alternative reality. From Robin McKinley to Diana Wynne Jones, with some Patricia Wrede, and R. J. Anderson -I enjoy a touch of romance with a good fairy story. Megan: Thank you all for adding to my reading list, as always! I recently re-read Pride and Prejudice and appreciated it far more after thirteen years of marriage. 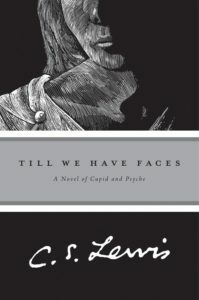 I am also a HUGE fan of Turner’s Thief books, since they remind me of both Pride and Prejudice and Till We Have Faces. In TWHF Orual never marries, but struggles to know God, and that was especially meaningful to me in my single years. Pride and Prejudice develops mutual respect between a man and woman, laying a solid foundation for a good marriage. 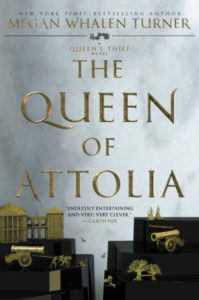 The Queen of Attolia combines a marvelous romance with a character’s struggling in his relationship with the gods, followed by The King of Attolia which shows deepening relationships in both directions. Stepping Heavenward is a fictional diary that spans Katherine’s life from age sixteen until close to her death after many years of marriage, trials, losses, and much growth in grace. It is romance that rings true. Janie: That’s a terrific list, Megan. And Hayley: there’s certainly nothing wrong with mixing genres. As I mentioned above, some of the best love stories are folded in to a much larger context. Romantic love is only part of the big picture, and humans err when we move it to the center. That’s why it’s important to nudge our kids toward healthier romantic reading, and never leave the impression that romantic love conquers all, justifies all, and lasts forever. Only one kind of love does that. If our kids are graciously oriented toward the greatest love of all, they can’t go wrong! The most memorable “romance” from my younger reading years: Christy by Catherine Marshall. I think Christy’s slow growth in maturity and wisdom over the course of the novel was impressive to teenage me, and her choice to marry, not the smooth-talking but callow preacher boy, but rather the older and more experienced doctor made me think about what is important in a potential mate. That’s a good one, Sherry! I devoured Christy shortly after it was published, but I was a little past the teen years by then! I’ll chime in on Christy, too–I cannot believe I forgot that one!!! My copy is so dog-eared, I’ll need to by another one when my daughter is ready for it. I also read Julie (also by Catherine Marshall). Might need to dust those off and re-read now that I’m 25-30 years older than my first few reads ;-). I watched the Christy tv show when I was a teenager and so badly wanted her to be with the preacher! As an adult I read the book and was so glad she choose the doctor! What a change in perspective! You ladies are my kindred spirits! I think I was 7 when I first picked up one of my mom’s Oke books, and I was fully hooked by 12. I also read all the other popular teen & adult Christian romance writers of the early 90s: Gunn, Theone, Wick, etc. And because I was a voracious reader, I devored, regularly rereading: L.M. Montgomery, Lurlene McDaniel, Elizabeth G. Spear (although I far preferred Witch of Blackbird Pond to Calico Captive! ), the later/romantic Little House books by Wilder, Madeline L’Engle, Ann Rinaldi, Jane Austin, the Brontes…. While I am grateful I had a plethora of “clean” options to satisfy my pre-/teen appetite for romantic reads, I think one of the few literary reasons I didn’t end up with my head completely in the clouds looking for an unrealisticly “perfect” man was Michael Phillips’ Corrie Belle Hollister series. Corrie’s thoughtful approach to seeking God vs a mate in her formative years and how she approached getting to know (determining his character and heart for God) the man she did end up marrying was not only unique in the fiction I was exposed to, but even then an example I wanted to follow. Phillips’ often preachy style in this series isn’t for everyone, but I’m definitely saving those for my daughter. Then I “grew up” and, after a detour or two, became a children’s/teen librarian. As such, I had a steady reading diet of current teen romance and I could rattle off at length the ones I would recommend over others. But, like several of you, my current romantic literary heart belongs to Megan Whalen Turner’s Queen’s Thief series. You all have pointed out its merits and I agree 10,000%. I don’t have much to add there. Except on the off chance that MWT is trolling and sees this: write faster, please! As a children’s librarian and now a ft mom of a toddler, I haven’t made the time to read ‘adult’ fiction in the last decade or so. But, because I so adore her early novels for young people, I did buy and read Shannon Hale’s adult novels, both romantic in nature. The Actor and the Housewife is my favorite ‘married romance’ book and Austenland is highly entertaining. Thank you for a great site and a fun post! Elisabeth–thanks for contributing to the conversation! I agree with many suggestions. I also enjoyed the Little House love story and the Anne of Green Gables love story, I think particularly so because these began in their childhoods and continued well into their respective marriages. And the Little House ones are true, too! I come back to these, married & a mother, and the re-reading is better than the original reading because of my own growth. I also LOVED Pride & Prejudice, although I didn’t try anything else by Jane Austen until adulthood. I read and loved Papa’s Wife by Thyra Ferre Bjorn. It also covers much more than just falling in love. It begins in Sweden and after years of marriage, they move to America. Pontus Franzon is a pastor who won’t get the idea that he should be married. But his maid thinks so, and thinks it should be to her. She finally becomes very bold and convinces him that they should marry, after which they begin a family (I believe they end up with 8 children?). It is written by one of the children. This is definitely a love story within a much larger overall story. I think it also depicted (in less depth) a couple of the children’s romances. Also Many Rivers To Cross by Steve Frazee. It covers a young woman deceiving a man into marrying her, and then has to keep on his trail before her protective father and brothers find him and kill him for deserting her. It sounds more intense than it actually is. It’s a fun book. I’m not sure, but this one might be defined as romance. It’s harder for me to say, because the story is basically all about them, but they aren’t together very often, so I’m not totally sure. And I loved many that I read by Lori Copeland, especially the Brides of the West series (my 6 sisters & I have all loved “Hope” the best). A warning on Copeland’s books: she wrote secular romances for 15 years before she began Christian romance. I’ve only read a couple books that she revised with a Christian outlook, and by them I judge her secular work most likely wasn’t scene-free. She switched to Christian in 1995. I only read a couple of her re-writes, and they weren’t as good as the ones that were clean from the get-go. What I have read of Lori Copeland proves to be romances. Like you ladies, I, too, loved Janette Oke books. But not The Bluebird And The Sparrow. Although it had a good ending as I recall, the whole book was so full of bitterness and envy that when finished, I put the book down and went around feeling depressed for a couple days. Some I have found after my teenage years and can recommend are Christy (as previously mentioned), but also Tisha by Robert Specht. It is a true story about a young woman who goes to be a school teacher in the Alaskan wilderness and comes to love a “half-breed” which is frowned upon by the community. I think this would be defined as love story, rather than romance. Another good one is Mrs. Mike by Benedict & Nancy Freedman. Another true story, about a young girl who is staying with her uncle in Alaska for health reasons. She marries a “Mountie” and they move North. The book mainly covers their married life, including the loss of their “first family” to widespread sickness. Very intense book, I felt. This is probably more love story than romance. I also enjoyed I Married Adventure by Osa Johnson, a true story that mainly covers their married life. Her husband, Martin Johnson was a photographer who captured Africa in the lens. They made trips back to civilization every year or two, I feel like it was, basically to gain enough money by showing the photography, to be able to buy a fresh supply of film and equipment and head back to Africa. The ending of this book was sad. They were on an airplane, and had decided that after this final trip, they would try to just settle down and have a real home and maybe adopt some children. She ends the book with the newspaper article about the plane crash which was fatal to Martin. 🙁 Also, this book has some content in it… intended cannibalism comes to mind… I don’t recall that they actually witnessed any, but I was grossed out and kinda skimmed that part, so I couldn’t actually say for sure. This book has the love story woven into the overall story. Another favorite of mine which I re-read a couple times, is Daddy-Long-Legs by Jean Webster. It is about an orphan, Jerusha Abbot, who is old enough she must leave the John Grier (Griar?) Home, but fortunately she has written a funny poem and a trustee decides to send her to college. She must write to him every month about her progress in her studies. But of course she has no hesitation writing about all of her life, and we see her falling in love with a “youngish uncle” (as she describes) of one of the other girls in the college. The book is a collection of the letters, and is good for many laughs. She does, however, have a few sentences about her interesting viewpoints about God, and I almost think she may have called herself an atheist. This content was very miniscule, and I found it extremely easy to ignore, even as a teen. But it is there, so be warned. I think hers would be defined as a love story, not a romance. It looks like I have favored love stories, if I’m defining them correctly. To be sure, I read my fair share of romances as well, but they don’t stick out in my memory like these. I got the steeplehill paperbacks from the library constantly. I didn’t foray much further than that, because I didn’t want to read anything with scenes. Steeple Hill was my go-to, but I another clean source is the Avon True Romances. I actually really enjoyed most of these, too. Especially Victoria and the Rogue. Sorry I’m so wordy. I wasn’t going to put the descriptions in, but then I decided that when I read comments with book recommendations, I like a little description to help me judge the book before seeing it’s cover. Haha! But seriously. Also, Lori Copeland’s books are funny books. I’ll try to make a quick description on “Hope” as an example. 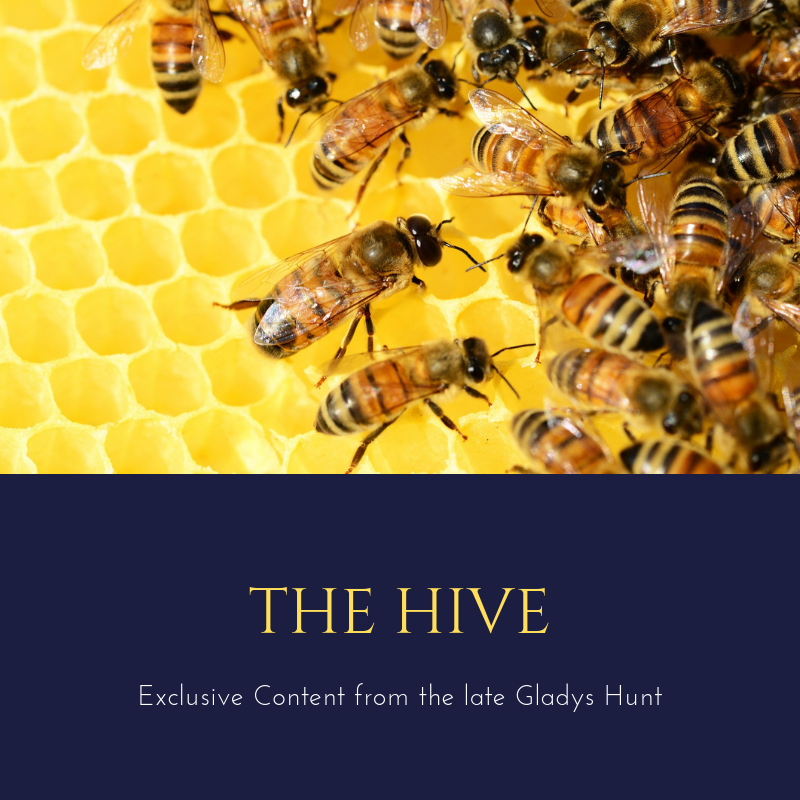 Hope’s father has died (her mother did years ago), so she and her two sisters have decided to become mail-order brides, so as not to be a burden upon their aunt. Hope, unfortunately, is kidnapped en route, by a band of outlaws who think she is the daughter of a senator (I think that’s what he was, anyway). They intend to keep her for ransom. She balks at the filthy house, spews incorrect Bible quotes (dad was a preacher, but she was never any good at memorizing Scripture), and gets in big arguments with the outlaws. One of them puzzles her, but in the end it turns out he is an undercover agent (explains why he takes her attempts at Scripture quotes and repeats them properly). Meanwhile, her groom eventually gets tired of waiting for the bride who will probably never show, and ends up falling in love with a new girl in town. In the end, of course everybody is happy. Thanks for all these great suggestions, Sabriena!